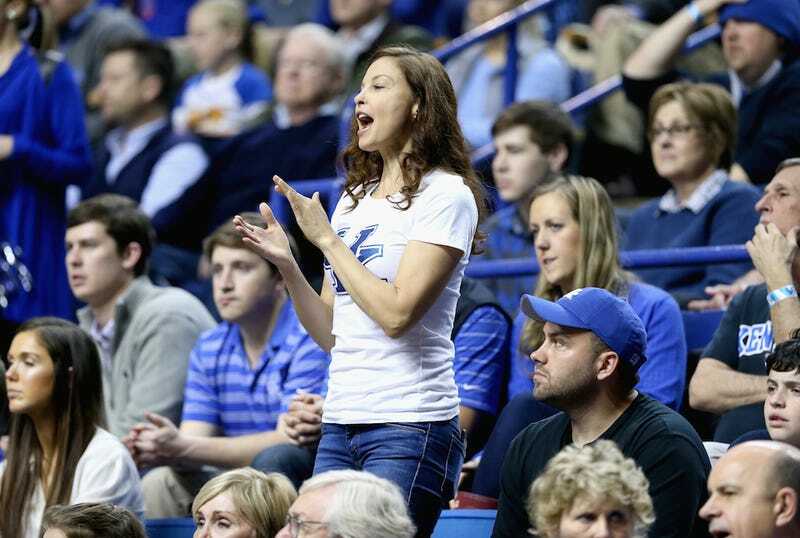 Insurgent star and longtime University of Kentucky basketball fan Ashley Judd received some ugly March Madness-themed Twitter backlash during Sunday's SEC Tournament championship game. After tweeting that the Arkansas Razorbacks were "playing dirty" in their attempt to unseat Kentucky from the no. 1 spot, Judd was attacked by a barrage of that particularly aggressive brand of Internet troll: the woman-hating sports enthusiast. Judd told NBC News (as pinpointed by E!) that the "amount of gender violence that I experienced is absolutely extraordinary," adding: "Everyone needs to take personal responsibility for what they write and not allowing this misinterpretation and shaming culture on social media to persist. And by the way, I'm pressing charges." I happen to be from Lexington, Kentucky, too*; Ashley Judd has been a beloved fixture at UK games for years, so I say this with the love and familiarity that comes with having seen the same celebrity on a Jumbotron since my early adolescence: YAS, ASHLEY! *And I just noticed that the row behind Judd in this photo is inhabited by several of my former high school classmates. Crazy! You guys just keep on wearing khakis, huh?